News of Sleep's Dopesmoker reissue has had me salivating since word crossed my inbox not too long ago. The album's new artwork has been released. What do you think? Typographically speaking, I'm not too impressed. I like the illustration, though I'm not sure if it's as compelling as the music. This isn't the most memorable image, certainly not to the iconic extent of something like Holy Mountain. 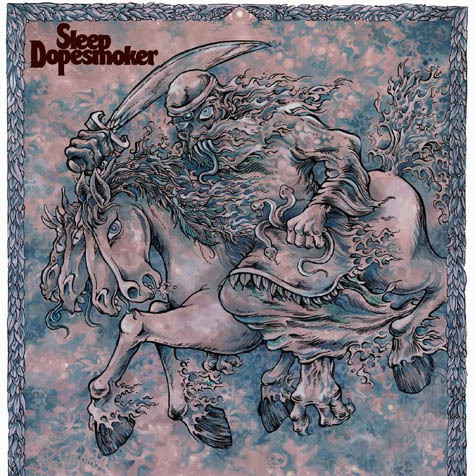 As previously announced, Southern Lord Recordings will release a deluxe reissue of one the most essential albums of modern times - Dopesmoker from stoner metal icons, SLEEP. This reissue is entirely remastered from the original smoke-encrusted Ampex reels, and features an unreleased live recording of one their greatest live performances -- “Holy Mountain” from San Francisco’s I-Beam in 1994 -- as well as a brand new artwork by long time SLEEP artist Arik Roper, who crafted something truly special and consciousness-expanding for the album’s rebirth. Check it out at THIS LOCATION. 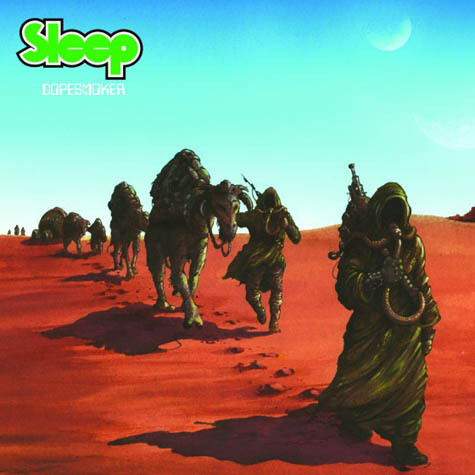 Dopesmoker stands as one of the towering achievements in recent metal history: a mesmerizing, intoxicating, and incredibly complex composition that remains unrivaled in the evolution of stoner metal. In conjunction with its release, SLEEP will be headlining the 2012 edition of the Roadburn Festival in Tilburg, Netherlands before departing on a 24-city tour of Europe and the UK commencing May 3 in Wroclaw, Poland.